google-site-verification: google82af41cbbb927c7d.html Grove Creek Family History: First Cousins, Twice Removed! 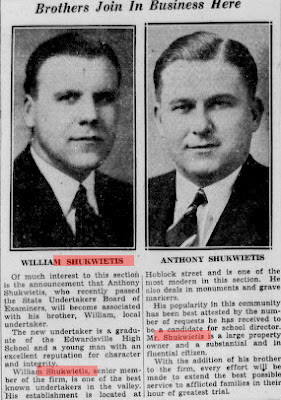 This week I discovered pictures of William and Anthony Shukwietis, who are my first cousins, twice removed. William owned a funeral home in Edwardsville, Pennsylvania. This article was announcing that Anthony was joining his brother in the business. It is fun to have these pictures and also hear a little about Anthony's personality as a "young man with an excellent reputation for character and integrity." I also didn't know that I had any relatives that were "substantial and influential citizens!" Have you ever taken the time to read old newspapers? They are fascinating and so different from the generic newspapers of today. I found this resource of newspapers while I was cruising through genealogy blogs that I regularly check. I thought I knew about the online newspapers for Pennsylvania! If you have Pennsylvania relatives, definitely check out this online archive! You never know what you are going to find. Definitely time for a happy dance!